When the weather is hot, grilling is in and that means you need some good condiments to spread and coat on all the meats you plan to grill! Whether you use these condiments to coat onto chicken, beef or fish you will be amazed at how incredibly delicious they are despite the fact that have no added sugar. Don't have time to make condiments? If you are going to purchase store-bought condiments, sauces or dips, make sure to check your labels. Reading labels for sugar can be difficult and sugar can be found in many items you least expect, even salad dressing and dry seasonings. It is better to just make it yourself and many of these can simply be stirred or blended. If you have a well-stocked pantry you will have everything you need to start making your own condiments today! 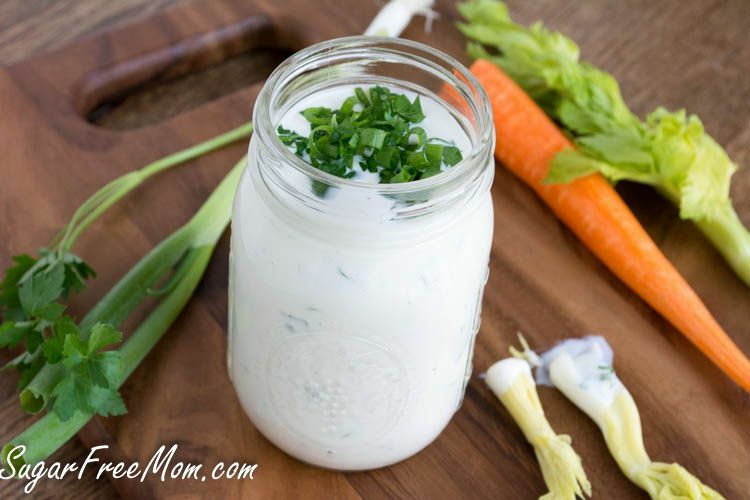 This soy, egg, and sugar-free ranch dressing is so easy, you'll never go back to store bought! Made with Greek yogurt and all the spices needed to make it just as tasty as Hidden Valley Ranch! If you're tired of the crazy amount of sugar in store-bought ketchup, try this healthier homemade version! You can choose to use honey or sugar-free sweetener for this ketchup it's up to you! This easy homemade barbecue sauce is free of refined sugars, high fructose corn syrup, and artificial colors! Once you've made my ketchup above the barbecue sauce is made in no time at all! Free of refined sugars, this super simple honey mustard is great on just about anything! Kids love this! Make it spicy using Dijon mustard or make it sugar-free by replacing the honey with your favorite sugar-free substitute. This easy and delicious pesto is fantastic on so many things, and is a great way to use up herbs from the garden! Toss in pasta dishes or spread on chicken breasts to grill! Made without artificial ingredients or preservatives, this pesto makes a wonderful marinade, sandwich spread, and so much more! For those with nut allergies in the family, this is the pesto to have on hand!